today I added a couple of indicators to my gnome-shell panel, like Skype, weather and some sensors. The problem that I'm facing is that indicators that take a considerable amount of space, like the clock (that is showing the time and date) shrank considerably. I realized that the total amount of space occupied by all these indicators never exceeds 50% of my screen width. I'd like to avoid this behavior, and allow each indicator to take the space it needs. Also note how the clock is no longer in the middle, but now it's on the right corner. 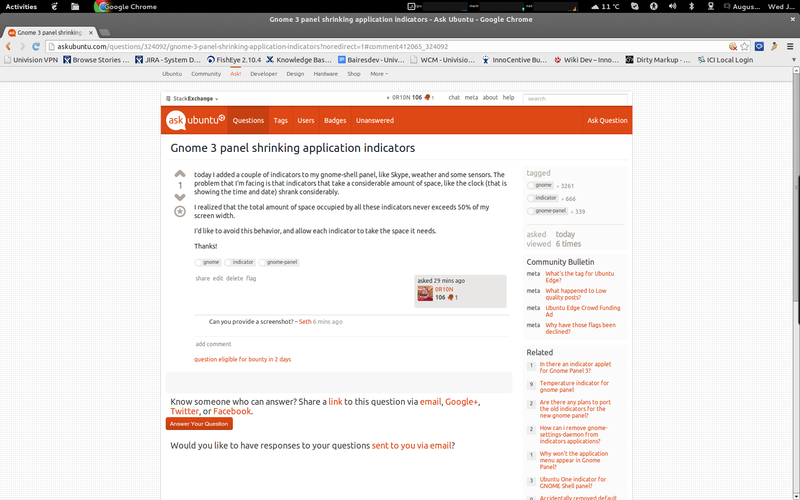 Browse other questions tagged gnome indicator gnome-panel or ask your own question. Gnome panel suddenly becomes transparent! How can i remove gnome-settings-daemon from indicators applications? Are there any plans to port the old indicators for the new gnome panel? Why won't the application menu appear in Gnome Panel? How to move all the indicators from bottom panel to top panel in GNOME 3.2.0? Use command line to add application to gnome classic panel?